Advanced formula body lotion helps white and smooth all skin types. 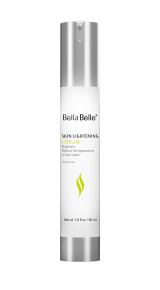 Bella Belle Magic Pearl Whitening Body Lotion is the ultimate in safe, gentle and effective natural use for larger areas of the body. The product provides an instant brightening effect with each application, giving your skin a brighter, more youthful glow from the first day you use it. The active ingredients work with your skin to provide long lasting results and even out skin tones. Apply on the body and massage into skins until fully absorbed. The light and no greasy texture this lotion quickly absorbed, provides a feeling of comfort during application and leaves your skin hydrated durably. Rich in natural hydrating components associated to a complex of lightening active ingredients, this product helps your skin to recover its suppleness and brightness after few applications only . For best results, use immediately after shower or bath. Use as often as desired. * Pearl Extract helps skin whitener & smoother. * Niacinamide renews the surface layer of the skin. * Alpha-arbutin Restores white skin and unifies pigmented body skins. * Macadamia Integrifolia Seed Oil soothes the skin.